Off today to do the Kepler Track. 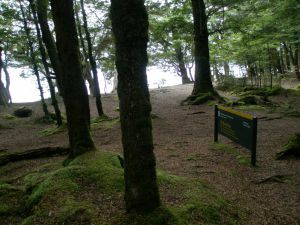 This is the second of the Great Walks I’ve tried – I walked Milford Track several years back, and coincidentally they both start in the small Fiordland town of Te Anau. After picking up my hut tickets from DOC (the Department of Conservation, who run the huts, and who sensibly insist that you book for the Great Walks) I headed off with my pack, which was stuffed with dehydrated meals and as light as I could make it (not nearly light enough). It’s a 45 minute walk round Lake Te Anau to the Control Gates, where the Kepler starts. The Gates are part of a hydroelectric power scheme and help regulate the water heading down to Lake Manapouri. The Kepler starts off easy enough – a one and a half hour walk along the lake, through lowland beech and podocarp forests, along to Brod Bay. I really enjoyed this, as beech forests (I’m talking Nothofagus, the southern beech, here, rather than the Fagus genus found in the northern hemisphere) are my very favourite type of forest. This was mostly red and mountain beech, with a few ferns and lots of moss. And lots of sandflies, but they can’t keep up with you enough to bite as long as you’re moving, so I left Brod Bay fairly quickly and came to what I was to later hear described as the Luxmore Grunt. Three hours uphill, or so DOC describes it. That bloody slog took me five. Alright, so I’m not very fit, and alright, so elderly people were passing me every other minute (I swear they’re not just getting hip replacements; there’s some serious bionics going on in there somewhere). A long hard hike up to the bushline – light rain, but at least it kept me from getting too hot. Ten minutes prior to stumbling out of the forest and into the light, I came across Ranger Jeff from Luxmore Hut, out doing track maintenance with his shovel. He told me that it was only a few minutes further up to the bushline, and luckily for him he was telling the truth or I would have gone back and visited hell on him and the next seven generations of his family. Bloody hills. 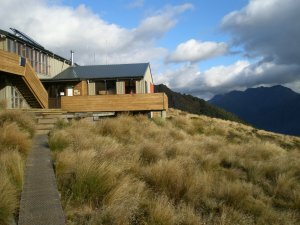 After breaking out into tussockland, it was another (and comparatively easy) 45 minutes until my first night’s stop at Luxmore Hut. And was I ever pleased to see it.